"Love is not just what we are obligated to do. It is not just what we have to do. Love is also what we want to do. It is what we have to do and what we want to do with all the power of our being." The start of 2012 found me in Kentucky helping my grandma sort through and pack up her belongings. It was an emotionally intense week and I was reading The Beautiful and Damned which was a book that required me to concentrate more than I usually do when I read, and on top of that I was having trouble sleeping. One night I finally got to sleep and immediately began to dream about Anthony and Gloria. Thankfully, I managed to somehow wake myself up from this nightmare and decided instantly I needed to start another book. I chose Irises thinking that it would be a good change of pace. This was a faulty assumption in many ways, because while The Beautiful and Damned was requiring brain power, Irises engaged my heart and emotions in a powerful way. I fell deeply into the book, and did not feel like I was exactly getting any recreational break in my reading! 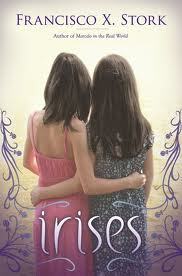 Irises is about two sisters, Kate and Mary, whose father dies and leaves them in an uncertain predicament. Their mother is in a permanent vegetative state and requires a lot of care. Kate has dreams about her future that might be coming true but they hang in the balance with their uncertain future. Her boyfriend wants her to marry him, Mary will still be in high school, and there's no money. Adding to their stresses, their father was a minister and the church needs them to move out of the parsonage so that the new pastor can move in. Both Kate and Mary are well defined characters. I felt like I knew who they were early on in my reading, Mary is the sensitive sister who is also an artist...and also the sister more likely to subjugate her own desires for her family. Very early in the book, for example, she has to miss a trip to the museum for her sister. And Kate kind of takes it for granted, not realizing it's one of the few things Mary finds joy in. And Kate is the more ambitious older sister, who is sort of rebelling against what the people in her world want for her. She's driven and desperate to leave behind the town she grew up in. And I have to say about a third of the way through the book, I really loved Mary and felt annoyed by Kate, but then I read this thought provoking blog post about female image and identity by Julie Clawson that made me rethink how I was reacting to Mary and Kate. But I also think this is something Stork wants the reader to consider as well, because as the story progresses Kate wrestles with whether or not wanting something for herself is being selfish and just how she can make the right decisions out of love. Before he passes away, her father talks to her and tells her that he wanted her to be strong but that he's now worried he took it too far and that while she can withstand the blows life may throw her, what cost will it come at for her? He's worried about her soul, but he reminds her that love makes everything that is heavy light. He's not as worried about Mary, and Kate agrees with him, because it seems that faith was in Mary's blood. This conversation sets the stage for the journey Kate goes on through this book, and she returns many times to puzzle over the things her father said to her. Kate has been in a long term relationship, but she's drawn to the new minister. He's young, handsome, and charismatic. The first sermon he gives after her father passes away is about truth and how he always promises to tell them truth. He goes on to say that to love is to sacrifice. Kate feels this sermon land on her which was one of my favorite parts because this isn't Christian fiction! "Kate remained very still. She saw Reverend Soto's eyes fall on her again, and for a moment she felt as if he had spoken directly to her, as if the whole sermon had been meant for her, urging acceptance of a truth that was unlike any truth she had ever heard." And it was like an instant change for Kate like it would be in Christian fiction, but she pulls this sermon in and begins to engage with this idea. So things are happening, Kate's boyfriend wants to marry her, but she's not sure she wants that at all and their aunt is visiting and pushing for them to get things worked out and refusing to stay with them. And Kate's been accepted to Stanford but she has to decide how she's going to go when their mother's care is such a huge burden on them. And that's when she starts to think that maybe they should let their mother go. But this is a decision she can't make on her own, and so she brings it to Mary. And Mary is stuck, she can't paint since her mother's accident because she can no longer see the light in people in order to paint them, so she's lost the thing that makes her happiest. And she desperately wants to hold her family together and she's searching out solutions on her own for what can be done. And it's easy to feel super sympathetic towards her, she's younger and less in control in her life and artsy and I feel like her best friend Renata is the built-in cheerleader for her. Which is good because Kate DOES overlook her needs. One of the things I think is well done is how Mary is the one who finds her father, and lets his soul go. She knows what needs to be done, but the actual letting go is so hard. But Mary's willingness to hold on or to sacrifice her own desires for her mother are not necessarily framed as the best thing. And she also strikes up a friendship with a boy that sets a really nice contrast to the decisions she has to make herself. Between Mary holding on and suppressing her own wishes and Kate trying to figure out how to fulfill her own desires you have the perfect story for exploring what love really is. So you have these two stories going on at the same time about these two sisters and how they are trying to figure out what to do about their futures and they are wrestling with the ideas of what's expected from them and what they actually want and need. And the book, in my opinion, does a really great job of probing into these questions about love and sacrifice and what makes someone selfish. Is there a way to love someone and do what's best for them and yourself at the same time when those things feel completely at odds? And there's also, of course, the idea of letting go and moving on and doing really hard things to give yourself freedom. And the conclusion friends, is very moving and freeing and beautiful and I cried. I loved this book a stinking lot. It's a beautiful story about finding hope and love in even in difficult and painful circumstances. I should add this link to this post by the editor because she talks about some of the other things that might be interesting to some of you such as writing across identity and economic diversity in YA.